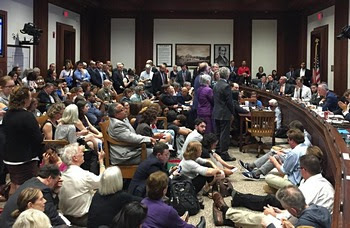 Hundreds of people were at the State House Friday to show their support for the Safe Communities Act, which has a hearing from 10 am to 3 pm before the Joint Committee on Public Safety and Homeland Security. The powerful testimony from mayors, legislators, and a broad swath of civil rights, social justice, health, faith, education and community-based organizations, combined with the sheer number of supporters, is made a real impact. Now we need your support to keep the pressure on our legislators. On Monday, June 12, we want to flood legislators’ offices with calls in support of the Safe Communities Act. So we’re asking you to call your state Representative and your Senator, even if they’ve already endorsed the bill. If you need help sharpening your message, check out our online resources. And if you don’t get a live person, leave a voicemail with your name, address, and your message of strong support for the Safe Communities Act. Urge your legislators to persuade undecided colleagues as well. And spread the word! Please share this message with your networks over the weekend. At the very least, encourage five friends or relatives to call as well! If you don’t know your legislators, find them here. Make sure to add them to your address book for easy reference in the future! And send an email to Speaker Robert DeLeo and Senate President Stan Rosenberg, as they are the ones who will decide if this bill goes to a vote. Last, but not least, if you want to know just how much we have to be proud of in our Commonwealth, see the tsunami of live-tweets coming out of the Safe Communities Act hearing: #SafeCommunities. See our previous post with more information about this issue. Call to Action: Make your voice heard, contact state legislators, support safe communities! To sign up to receive an email when a new post goes up on our website click on the “follow this website” button on the right or if you are on a mobile device, below this post. To sign up for our newsletter, fill out this form. To join our leadership group fill out this form. Would you like to become more involved in planning and strategy? NO EXPERIENCE REQUIRED. See this post.